Community Businesses Light Seven Bridges over two-miles of I-805 in mid-San Diego. 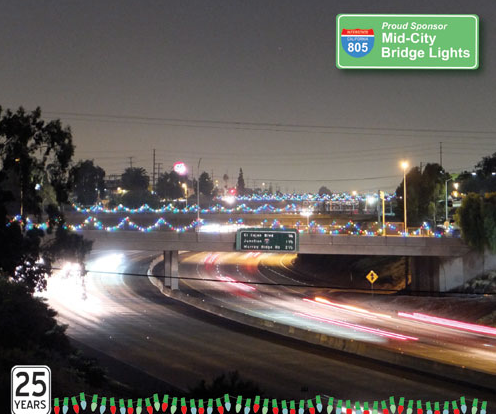 LIGHTING THE WAY--This year marks the 25th anniversary of the holiday light display on the seven I-805 bridges that traverse San Diego’s Mid-City communities of City Heights, North Park, and Normal Heights. This year also comes with a switch from 4,000 incandescent bulbs to energy saving LEDs. This one- time investment of $22,000 also included electrical upgrades which were financed with grants from County Supervisor Ron Roberts - 4th District, City Council President Todd Gloria - District 3, San Diego Gas & Electric, The Mid-City Landscape Maintenance District, along with sponsorship by Sierra Display, Inc. The coordination with Caltrans was achieved with the direct assistance of 76th District Assembly Member Toni Atkins. Annually, the light display, which shines brightly from Thanksgiving through the New Year, is produced through the diligence of the El Cajon Boulevard Business Improvement Association, with the assistance of the Adams Avenue Business Association, North Park Main Street, and City Heights Business Association. The 50 day lighting display can be appreciated by the passengers in the approximately 800,000 vehicles that will cross one of the seven bridges, and another 1.2 million driving the two mile length of the I-805 from dusk until the wee hours of the night. Initiated by the Adams Avenue Business Association in 1988 on a single bridge, the display caught the attention of The El Cajon Boulevard Business Improvement Association. Talk of "why not add our Boulevard bridge" morphed into a "why stop there" attitude. By year three all seven bridges were adorned.